In 1960, a Norse settlement was discovered at L'Anse Aux Meadows in Newfoundland, Canada. This is the only known location of an abandoned Viking town in North America. According to the Icelandic Sagas, in about the year 985, Bjarni Herjolfsson was thrown off course in a great storm, and sighted a new continent west of Greenland. He did not go ashore. Starting in the year 1000, Leif Erikson led several expeditions to the new continent, and gave it the name "Vinland" due to the abundance of grapes in this land. In the 1880s, a local college professor believed that he had found the remainder of Norse settlements in Massachusetts. During that period, several archeological digs were made along the coast with the goal of discovering traces of ancient Viking settlements. 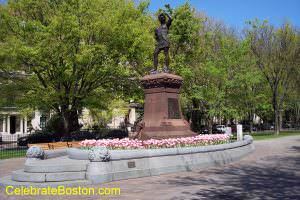 The excitement of purported Viking discoveries in Massachusetts culminated in 1887 with the erection of the Leif Erikson Statue on Commonwealth Avenue (at Charlesgate East). The statue is the work of Anne Whitney. The achievements of the Norse explorers cannot be understated. What is strange is that to this day a statue of John Hancock (and other revolutionary patriots) has never been erected in Boston, exemplifying the ancient tradition of whim-of-the-day planning in the city. Leif Erikson came some time in the year 1000, and it was the theory of the late Eben N. Horsford, who devoted much time and care to Norse investigations, that he sailed up the bay, crossed Boston Harbor, and penetrated the Charles River to Cambridge and Watertown, where he attempted the founding of Vineland. So strong was was Professor Horsford in this belief, that he caused stone tablets to be placed at various points, and the 'Norumbega Tower' to be built in Weston on the Charles River side." A final note about the monument is that Leif Erikson is of course looking in a westward direction.